What future for Old Oak? Scrubs Lane (the A219 north south route on the eastern border of the OPDC area) is seeing a wave of development proposals. 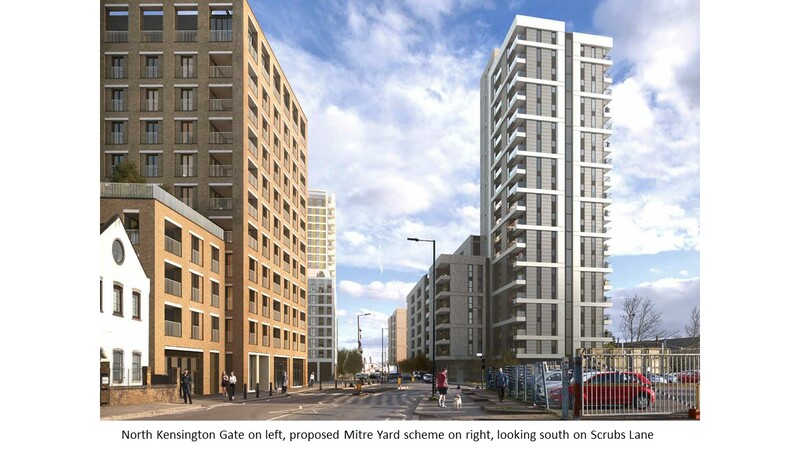 Planning approval granted to the scheme at North Kensington Gate (South site) was swiftly followed by a decision of the OPDC Planning Committee to grant permission to Aurora Development’s second application on its northern site at 115-129a Scrubs Lane. 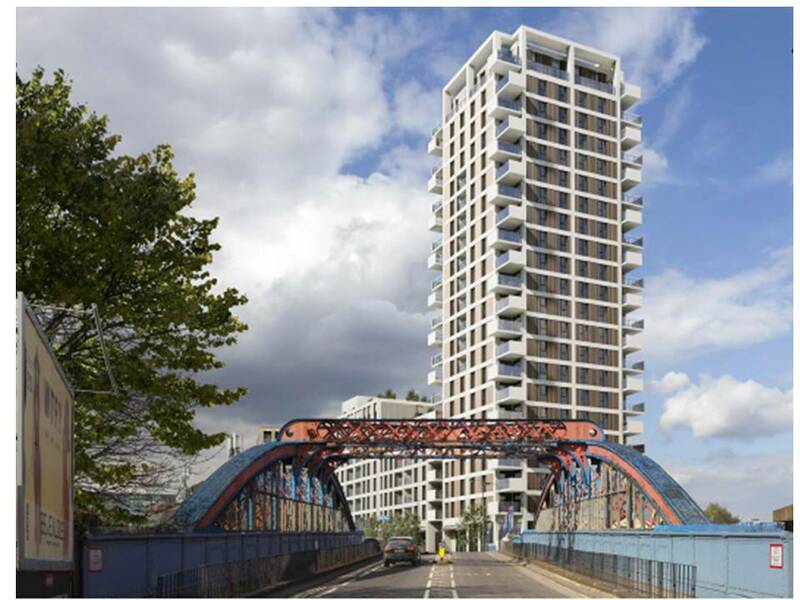 This scheme involves a 22 storey tower, with 164 housing units above ground floor commercial space. Give that this is the first building of anything like this height within the surrounding area, the application proved very contentious. Strong objections were submitted by Historic England, RB Kensington & Chelsea, and LB Hammersmith & Fulham. There were 39 objections from local residents. Neighbouring waste contractors European Metal Recycling pointed out that they are not intending to move their own operations anytime soon. The density of residential development on the site (448 housing units per hectare) is in excess of London Plan standards even for sites with the highest levels of public transport accessibility. ‘North Kensington Gate’ has very poor transport links. This will remain the case until the HS2 terminal and a (possible) Hythe Road Overground station open, scheduled but not certain for 2026. The vote at the OPDC Planning Committee was close, with the three independent members of the committee and its non-elected chair outvoting three of the four local councillors on the committee. This decision was followed by submission of a planning application for a further residential development at ‘Mitre Yard’. The developers are the City and Docklands Property Group. This involves two sites across the road from North Kensington Gate. The sites are separated by the private access road to the EMR and Powerday waste sites. This road is used by large numbers of HGVs and already creates daily traffic jams in Scrubs Lane as these vehicles enter and leave the site. EMR has again objected strongly to the application. The proposed development is for 200 housing units above ground floor commercial space. The affordable element of the development, in the application, is for 35% of the units to be at ‘discounted market rent’. The discount proposed is the minimum 20% of market rent. This qualifies (just) as ‘affordable housing’ in terms of current London Mayoral housing policies. But in reality the building of such flats will open up viable housing opportunities for few if any of the existing low income residents in the area. It is understood that the application will be considered by the OPDC Planning Committee on July 12th 2017. If this application is approved, and this development constructed, the view looking south along Scrubs Lane will be as above. In the first draft OPD Local Plan, this location was described as a ‘sensitive edge’ of the OPDC area, suitable for low and medium rise buildings and adjacent to two conservation areas. The latest Regulation 19 Draft Local Plan introduces the concept of four ‘clusters’ along Scrubs Lane, each to be allowed one tall building. An application for a third proposed tower at 2 Scrubs Lane looks likely to surface shortly. Cargiant versus OPDC – what future now for ‘Old Oak North’?